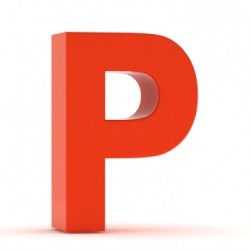 P is the 16th letter of the English alphabet or the sound of this letter. An example of p is the first letter in the word "plant." "p." YourDictionary, n.d. Web. 09 April 2019. <https://www.yourdictionary.com/p>. The 16th letter of the modern English alphabet. Any of the speech sounds represented by the letter p.
The 16th in a series. Something shaped like the letter P.
P A hypothesized textual source of certain portions of the Pentateuch that have a formulaic style, contain genealogical lists and descriptions of rituals, and use the name "Elohim" to refer to God. Drafted in Philadelphia in 1787, the Constitution begins with the words We the People. I'm doing p good, how are you? (metrology) Symbol for the picoohm, an SI unit of electrical resistance equal to 10−12 ohms. (computing) The ASCII control character data link escape in caret notation. Peta (P), from the Greek penta, meaning five, translates to quadrillion, referring to the fact that, in terms of order of magnitude in base 1,000, Peta is 1,000 5 . In order, that puts it right behind kilo (thousand), Mega (million), Giga (billion), and Tera (trillion). In terms of the electromagnetic spectrum, PHz (PetaHertz) is a quadrillion (10 15 ) Hertz, which is in the range of visible light, ultraviolet (UV) light, and x-rays, none of which currently have any application in telecommunications. A Pbps would be a quadrillion (10 15 ) bits per second. In transmission systems, therefore, a quadrillion would be exactly 1,000,000,000,000,000, since the measurement is based on a base 10, or decimal, number system.That definitely would be broadband, if it were possible, but it is difficult to imagine a contemporary application for that level of bandwidth. In computing and storage systems, a PB (PetaByte) is actually 1,125,899,906,842,624 bytes (1,024 5 , or 2 50 ) bytes, as the measurement of internal computer memory is based on a base 2, or binary, number system.The term PB comes from the fact that 1,125,899,906,842,624 is nominally, or approximately, 1,000,000,000,000,000. Until recently, a petabyte was rarely even mentioned. A very few supercomputers and supercomputer centers have access to a PB of networked storage. Google, the Web search company, in 2004 reportedly had 100,000 or so servers that shared a distributed, fault-tolerant file system on the order of a PB.To put a PB in further perspective, some sources suggest that the total volume of information contained in 20,000,000 four-drawer file cabinets full of 250,000,000,000 pages of text would equal approximately 1 PB of storage. See also byte, electromagnetic spectrum, and Hertz. 51, p. 88; Bersch, Jahresb. He arranged to have them delivered to Fairhaven by 1:00 p.m. Phys., 18 59 , 55, p. 129; W.
They landed at 10:30 a.m. and arranged the return trip for 8:00 p.m., rented a car and drove to Samantha's house.